Intro from Ann: In an effort to continuously inspire VCB members we are bringing you case studies on how bloggers managed to create highly-shareable blog posts. Meet our today’s guru David McSweeney! While (at the time of writing) it is not my most overall shared article, I suspect by the time this interview goes live it will be. Certainly in terms of performance in one day, my most shared article across social media is actually my most recent – this post I wrote up about a negative SEO attack against my website. In a nutshell the article details how a bad review I posted of a link network (well, technically a link marketplace) on my website has been the target of a negative SEO blast (over 11,000 spammy links in a month) to try and knock it out of the SERPS. 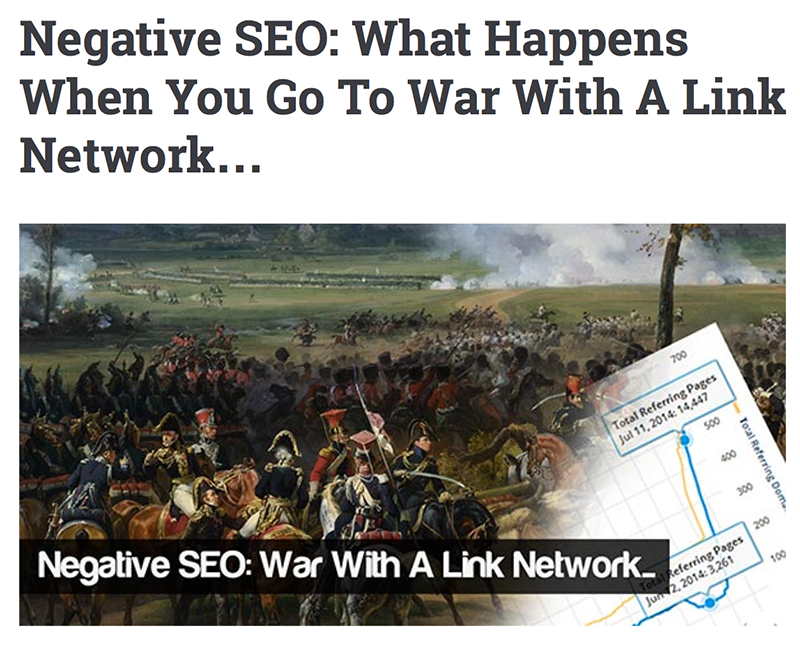 While due to the nature of the attack I can’t say with 100% certainty, I am 99% certain the negative SEO attack is coming from the link network itself. In just over 24 hours the article has been shared over 200 times across twitter, facebook & g+. Why did it do well? There are a few factors that have contributed here. Firstly, the article was retweeted by an influencer – in this case Rand Fishkin of Moz. Rand’s tweet alone brought in 400-500 visitors over a period of 3/4 hours and started a flood of retweets, which in turn brought more eyeballs and more retweets. This snowball effect is the beauty of viral/social traffic and it is massively amplified if you can get an influencer to share your content. Include them in the article (quote/interview etc). Expert roundups for example are very popular at the moment and MyBlogU has a great tool for helping you gather quotes from other bloggers. Link to them from the article. Most bloggers (even the A list ones) will check their referrals regularly and wordpress will also notify of new incoming links. To be doubly sure they’ve seen it, drop them an email or tweet letting them know you’ve linked to them! Reach out. If you haven’t quoted or linked to the influencer, but think they/their audience may be interested in your article then reach out and let them know. Just don’t overdo it and only reach out if you genuinely think they will have an interest in your article. Rule #1 of building relationships is don’t be annoying! The 4th method involves targeting the influencers of the influencers… but it’s a little complex to explain here! In my case I suspect Rand saw my post either through incoming links (I included a link to his excellent post on the need for an irrefutable example of negative SEO) or through a share on inbound.org. We live in an age of content overload and with millions of new blog posts going live every day you have to make sure your content stands out from the crowd. What have you got that no-one else has? Well, quite simply only you are you! Including your personal experiences whenever possible in your writing then will guarantee that you have a point of difference. As a bonus, it will also make your content more engaging and more likely to be shared! My post was my personal story about my experience with a negative SEO attack, which ensures it has that point of difference. NB: Make sure it’s not all about you though and that while you are writing about your experience, there is a takeaway for the reader! Negative SEO is a big concern (and the topic of some debate) in the SEO industry at the moment, so with my article covering this, there is a good chance that visitors will be both interested in the information and likely to share. I included a lot of detail in my post with screen shots/stats where appropriate. This actually is an odd one for me as my content generally tends to be pretty lengthy (my average article is around 3,000 words). While I would still advocate long, detailed content (for a number of reasons), it is difficult to deny that it can sometimes suffer from the TL;DR problem and a shorter blog post (in this case around 1,000 words) can often be more shareable. Visual information, i.e. infographics/videos, is also great for attracting social shares. Make sure that your content is as easy to share as possible. Hopefully it goes without saying that you should include social sharing buttons in your post, but additionally ‘Tweet this‘ links for specific quotes within your content work really well. If you want your readers to share your content then make sure you ask them! A simple call to action at the end of your posts prompting the reader to share the post in their favourite social network will lead to additional shares. If they have read to the end then you can pretty sure they have engaged with your content. Give readers an incentive to share your content. This could be in the form of an additional report, a pdf version of the post etc. Social Locker is a great wordpress plugin that allows visitors to ‘pay’ for locked content with a tweet, like etc. Taking this a stage further you can also use added value to turn visitors into email subscribers – Brian Dean has this down to a tee. From editor: For more tips on promoting your content bookmark this awesome collection of startup resources by PakWired as well as take our Udemy course!